If you’re a victim of the buggy update, restoring your iPhone via iTunes using an iOS 8.0 firmware file appears to be a fix for now. The easiest solution appears to be downloading the iOS 8 image for either the iPhone 6 or 6 Plus direct from Apple, then plugging your phone in, holding the Option key, and clicking Update on your phone’s info screen in iTunes. Select the IPSW file you just downloaded, and it should roll it back to iOS 8 without removing any of your apps, messages or settings, as we’ve verified with our own hardware. An Apple Store should be able to perform this fix for you if you don’t have access to your computer — our own Sarah Perez is on scene at a local store now where this fix is being performed for some affected customers. Warning! Many users of iPhone 6 and 6 Plus, myself included, are seeing cell service knocked out by this update, and Touch ID also seems to not be recognized. It could also be a factor of doing an over-the-air update, as some phones which updated using the tethered version via iTunes are apparently working. Hold off on updating any iPhone models until this gets sorted out, just to be safe. Apple has a new version of iOS 8 out, just a short time after the initial launch of the software. The update, 8.0.1, includes a number of fixes, but most notably (and listed first), it addressed the bug that prevented HeatlhKit apps from being available at launch. It also zaps some bugs with third-party keyboards, which should make them remain the default option until a user switches to another, which has been a sore spot for fans of the new external software keyboard options. Unfortunately, installing the iOS 8.0.1 update revealed that despite Apple’s promised fixes, it actually completely disables cellular service and Touch ID on many devices, though some iPhone 5s and older model owners report no issues. The bottom line is that you should definitely NOT install this update, at least until an updated version appears, at which time we’ll let you know it’s safe to go ahead. As you can see in the image below, Apple is also addressing an issue that blocked some photos from appearing in Photo Library, fixing reliability concerns around Reachability on iPhone 6 and 6 Plus (which brings the top of the screen down when you double touch the Home button), zapping bugs that cause unexpected data use when communicating via SMS or MMS, and improving the “Ask to Buy” feature for Family Sharing, specifically around in-app purchases, in addition to other minor bugs. 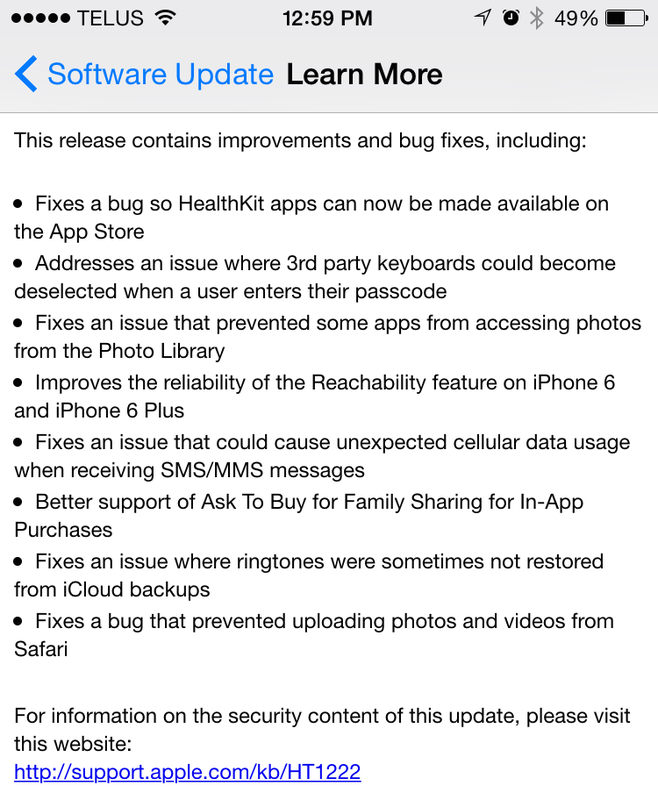 HealthKit apps should start appearing on the heels of this update, so watch out for those. We’ll now be able to better see how they incorporate data into the Health app, and how Apple has executed health data sharing between apps, too.